Director John Curran's Stone is truly one of the strongest dramas that I have seen in quite some time. From despair to redemption for one man, to redemption to despair for another, Stone is a chilling tale about two men who are more similar than different. Brilliantly pieced together by Curran, Stone features two Hollywood greats that include Robert De Niro and Edward Norton which are easily some of their best performances to date. It's also the subtle elements of Stone that make it so gripping to watch like the religious underpinnings which are littered throughout the story such as the "churchy" shock jock radio station that is played in the background. 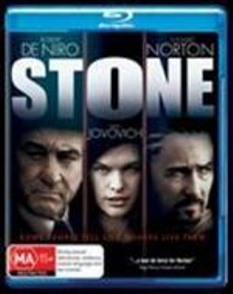 Even though at times, Stone feels like there are two different stories running parallel to each other, they are actually intertwined and revolve around Jack Mabry (De Niro), a parole officer who is about to retire in a month and Stone (Norton), a man who has been in jail for 9-years as he was accused and convicted as an accessory to his grandparents murder. Like the religious overtones throughout the story, Milla Jovovich plays Lucetta, the amoral wife of Stone who has been sent by her convicted husband to seduce and destroy Mabry. As we soon discover, Mabry's life is far from perfect and although he has attempted to live his life righteously, it is far from ideal and even though his wife Madelyn (Frances Conroy) only has a handful of words, her expressions and appearance is far more than words could ever convey. As Jack works with Stone to determine whether he is eligible for parole, Lucetta begins to exploit his weaknesses and straight before our eyes, both men seem to have a huge role reversal of morals with Stone discovering "enlightenment" and for Mabry, the destruction of his own institution, a 43-year old loveless marriage. At times, Stone is quite a poetic movie but under its sometimes devastating core, it is quite a fascinating and insightful drama. De Niro and Norton work amazingly well together but even the supporting cast members that include Jovovich and Conroy, one who plays the seductress and the other, the scorned woman work so well with the story and the two main characters. Amazing! Stone supports 1080p/MPEG-4 AVC with Dolby TrueHD 5.1 that looks and sounds amazing. The video quality of this release is perfect with no errors whatsoever. With vibrant colours, sharp picture quality and deep levels of black, this film could almost be considered reference material. The Dolby TrueHD 5.1 compliments the movie well and everything sounds crystal clear from foreground voices to background sounds like weather, insects and cars, it comes together quite well. For special features, there is a short Making of Stone featurette and some theatrical trailers and that's about it. It would have been interesting to have some commentary but alas we don't. Nonetheless, it's still a very impressive film that comes recommended!